Oh My! 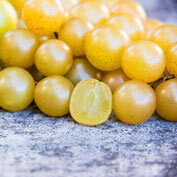 Seedless Grape | Gurney's Seed & Nursery Co.
Oh My! 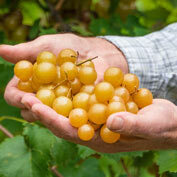 Seedless Grape will change the way you think about, and eat, muscadines. 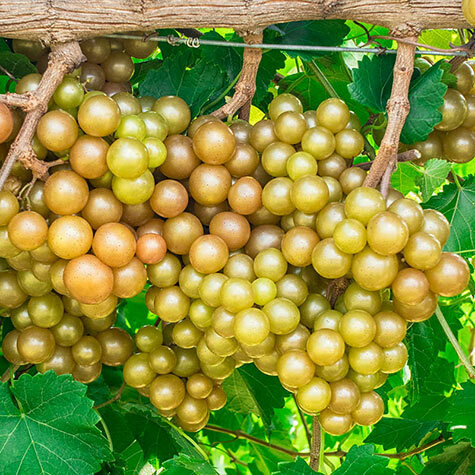 Bite into these perfectly round, golden fruits and experience an explosion of juicy sweetness and rich, aromatic muscadine flavor. You can savor the flavor and the experience without worrying about spitting out seeds or skins. Oh My! 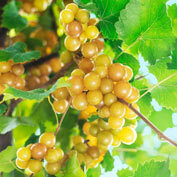 is the first muscadine that reliably yields full-sized, seedless, bronze-colored fruits with tender skins. And, it's productive too! Each vine yields 40-plus pounds of fruit. A breeding breakthrough! Native to the Southeast United States, muscadines are treasured for their flavor and vigorous vines. But big seeds and tough skins are their downsides. Most people pop traditional muscadines into their mouths, extract the pulp, and spit out the seeds and skins—not a neat experience, and one usually reserved for the outdoors. For over 100 years grape breeders have attempted to develop muscadines that are seedless with easy-to-chew skins. After a lifetime of work, developing his U.S. patent-issued methods in North Carolina, renowned grape breeder Jeff Bloodworth finally achieved this long-anticipated breakthrough: seedless, full-sized, thin-skinned, wonderfully sweet muscadines. Full-sized fruits! Oh My! yields clusters of bronze-colored, 3/4-1 in. fruits that ripen in early to mid-September in the North Carolina area—and even earlier in more southern regions. The fruits usually hold onto the vine beyond firm ripeness—and they hold through rains without cracking. This is a huge benefit for Southeastern grape growers who regularly deal with late summer and early fall rains. Easy Eating—and Easy Cooking! With Oh My! Seedless, it's a breeze to making jellies, juices, whole berry preserves, grape hull pies and other recipes that Southerners have enjoyed over the decades. Long Lived! 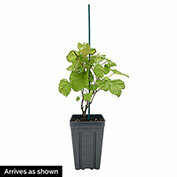 Muscadine grape vines are extremely long-lived. Some live for 400 years or more! 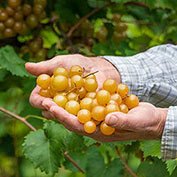 Plant a muscadine, and you can look forward to enjoying it for a lifetime. Easy to grow! Like other muscadines, Oh My! is vigorous and easy to grow. In our test vineyards, it withstood three winters when temperatures dropped near 0°F. It also resists late spring frost injury. When temperatures dropped to 23°F, its emerged green tissue did not freeze. 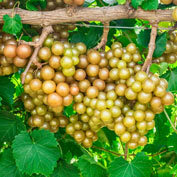 Like other muscadines, it can be grown with minimal spraying for insects and diseases, making it the best-suited grape for organic production. Self-pollinating. Zones 7-10. U.S. Patent No. 9706726. Yield: Enjoy great yields, for a lifetime! Muscadines grape vines are very long-lived, and some live for 400 years or more. Fruit: Seedless, thin-skinned, full-sized, bronze colored, round fruits, with juicy sweetness and rich, aromatic muscadine flavor. 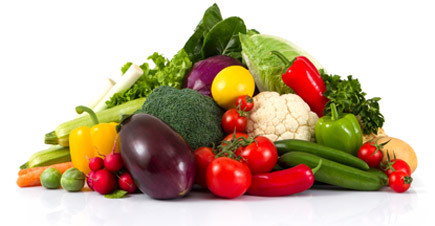 Fruits are generally 3/4-1 inch. Soil Requirements: Well-drained, slightly acidic, sandy loam soil. Comments: This breeding breakthrough is truly special! Enjoy the beautiful, bronze fruits, seedless and thin-skinned, full of juicy sweetness and rich, aromatic muscadine flavor. Long-lived and vigorous, these grape vines can be enjoyed for a lifetime. Like other muscadines, just minimal spraying is needed to control insects and disease. Black rot resistant.